Find a 1913 penny? Want to know how much it’s worth? Old 1913 pennies are scarce coins that range in value from a few cents to more than a few thousand dollars! So… what’s the difference between a common 1913 wheat penny and a valuable one? Finding 1913 Lincoln cents in pocket change is pretty hard these days — but they still occasionally turn up. Since they’re so hard to find, it’s only natural to wonder if 1913 pennies are rare. The general answer is no, 1913 Lincoln wheat cents aren’t necessarily rare. In fact, nearly 100 million 1913 pennies were made (details below). The 1913 pennies that were made at the Philadelphia Mint for circulation are the most common. You can tell which 1913 wheat pennies were made in Philly because they don’t have a mintmark under the date on the obverse (heads side) of the coin. 1913 pennies struck at the US Mint facilities in Denver (“D” mintmark) and San Francisco (“S” mintmark) are far scarcer… and more valuable. The special 1913 matte proof Lincoln cents struck at the Philadelphia Mint for coin collectors are among the scarcest of all 1913 Lincoln cents. Now, what you probably came here to find out… the current 1913 Lincoln penny value. 1913 penny with no mintmark — worth 15 to 50 cents in well-worn condition. The 1913 Lincoln cent is very scarce in uncirculated condition, with values ranging from $75 for a typical specimen to more than $10,000 for one in gem uncirculated grade with full original “red” color. 1913-D penny — varies from $3 to $10 for a typical well-circulated example, to $150+ for average uncirculated pieces, and $3,000+ for especially nice uncirculated specimens. 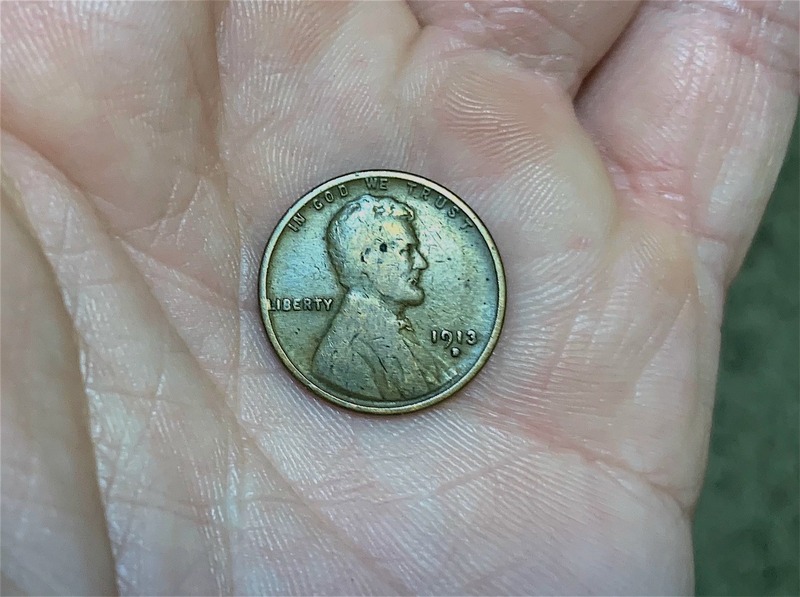 1913-S penny — the scarcest of the 1913 business-strike pennies, it’s worth $10 to $25 in well-worn grades to more than $200 in uncirculated condition. FUN FACT: The 1913-S penny holds the record for the most valuable 1913 Lincoln cent ever sold! Someone paid $63,250 for a “Red” specimen graded Mint State-66 by Professional Coin Grading Service. 1913 matte proof penny — these special 1913 Lincoln cents were struck by the Philadelphia Mint only for coin collectors. They feature especially nice, sharp strikes and matte surfaces. Only a couple thousand proof pennies were made in 1913. Today they’re worth about $300 and up. *Values listed above are for 1913 Lincoln cents with no signs of damage — including cleanings, holes, bends, heavy nicks, or other types of problems. Are There Any 1913 Penny Errors? There are only a few 1913 error pennies known to exist. 1913 off-center pennies — These were struck a little askew, leaving blank crescents on the coin. Some of these errors are off only 5% or 10%, while others may be off by 50% or more. A 1913 cent just a little off center (like 5%) could be worth $10 to $20, while more dramatic off-center strikes have sold for hundreds of dollars. 1913 wheat pennies with die cracks or die cuds — As coin dies age, cracks and chips can form. These result in a mirror-opposite raised crack on the coin. Collectors love these! A 1913 Lincoln penny with a die cud could be worth $100 to $200 or more, depending on the size and location of the cud on the rim. 1913 wheat pennies with die cracks range in value from $3 to $5 for a piece with a small die break to more than $100 for errors exhibiting large cracks in prominent locations — such as near Lincoln’s face. 1913 Lincoln cents with repunched mintmarks — An error penny where the mintmark was punched at least twice and at slightly different angles or locations could be worth big bucks. 1913 repunched mintmark pennies are pretty scarce… but similar pieces have sold for $25 to $50 or more and are definitely worth looking for. Additional 1913 penny errors include brockages, die caps, and many other types of errors. Though very difficult to find, these are valuable coins. Some are worth hundreds, even thousands of dollars — depending on the location of the error and the overall condition of the coin. Old pennies have some interesting stories behind them — and that’s true of 1913 Lincoln cents, as well. The 1913 wheat penny was designed by Victor David Brenner. He was a popular sculptor who designed the Lincoln penny in 1909. The artist’s initials, “VDB,” can be found on the reverse (tails side) of a select number of 1909 pennies. Sadly for Brenner, many folks felt his initials were too prominent and ordered their removal. Weeks after the first 1909 pennies rolled off the presses, VDB was gone. Brenner’s initials were restored to the obverse (heads side) of the Lincoln cent in 1918. To this day, you can still find the VDB initials under Lincoln’s shoulder. The wheat stalks on 1913 pennies represent national prosperity. Upon its release in 1909, the wheat penny design became very popular with the public and remained on the Lincoln cent until 1958. In 1959, wheat pennies were replaced by Lincoln Memorial pennies. What Else Happened When Your 1913 Lincoln Cent Was Made? President Woodrow Wilson was inaugurated, becoming the 28th president in the first of his 2 terms. Suffragettes in Washington, DC, and London demonstrated for women’s rights. Garment workers in New York and Boston were on strike for pay raises, reduced hours, and better working conditions. A bill founding the US Federal Reserve System became law. Americans were introduced to modern European art during the Armory Show in New York. Billboard magazine debuted a popularity list for popular vaudeville songs, foreshadowing the popular Top 40, Hot 100, and other song charts that came later in the century. Among the top songs of 1913 were “When Irish Eyes Are Smiling” by Chauncey Olcott, “Peg O’ My Heart” by Charles Harrison, and “The Spaniard Who Blighted My Life” by Al Jolson.